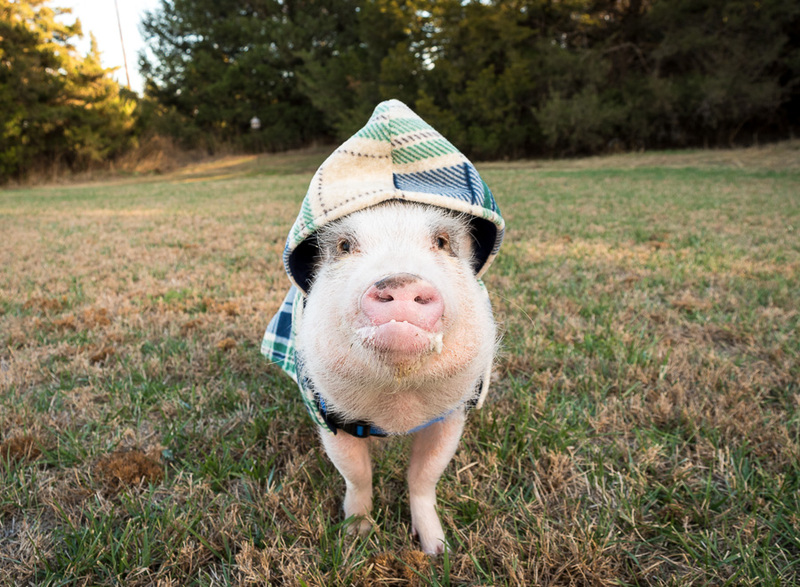 It’s officially winter, and most mini pigs hate cold weather. If allowed, Oscar would spend the entire winter season in front of our heat vent and avoid outside completely. However, Oscar isn’t litter box trained, so he has to go outside several times a day to potty, even if it’s freezing out. In order to make these trips more pleasant for him, I decided that Oscar needs a winter coat. Last year I decided to use my limited sewing skills to make Oscar a coat. We used that one and a dog coat that we bought Oscar for his first winter, and they worked okay. Eventually, the snaps broke off of the one I sewed Oscar, and the dog coat was sturdy but wasn’t a perfect fit. As with most dog coats, the underneath of this coat went too far down Oscar’s belly, so the back belt had to be removed so that Oscar could potty. Oscar has grown a lot, and he needed a new coat for this winter. 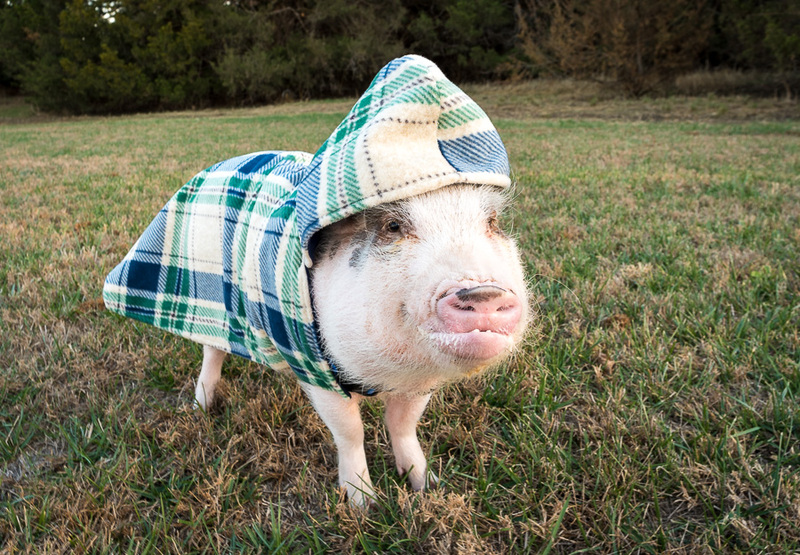 Since we didn’t have a perfect coat for him last year, I decided to buy Oscar an actual mini pig coat this time. We loved Oscar’s last outfit from Snort Life, so I decided to order his coat from there. I quickly took his measurements, picked my fabric, and placed my order, excited for Oscar’s first actual mini pig coat for this winter. When Oscar’s coat arrived, I was thrilled. I knew his coat would be adorable, but it’s also super practical. First, he has no problem going to the bathroom in his coat, which is important and makes it better than nearly all dog coats we’ve tried. Second, the material is soft and thick to keep him warm, but it’s not overly heavy so Oscar can wander the yard and move around in it easily. He doesn’t mind his coat being on at all and will wear it for as long as I let him stay outside. Third, it has a slit in the top so that we can hook a leash to his harness, which is helpful so he can wear his coat and be securely leashed at the same time. Lastly, his coat has a hood to help keep his ears warm and make him look ridiculously adorable at the same time. The only challenge we’ve had is that, as I mentioned in my last post, Oscar doesn’t like to be touched on his right side near his face. This has made it tough to get the coat on him at times, so we started using treats when we put his coat on, and it’s less of an issue. 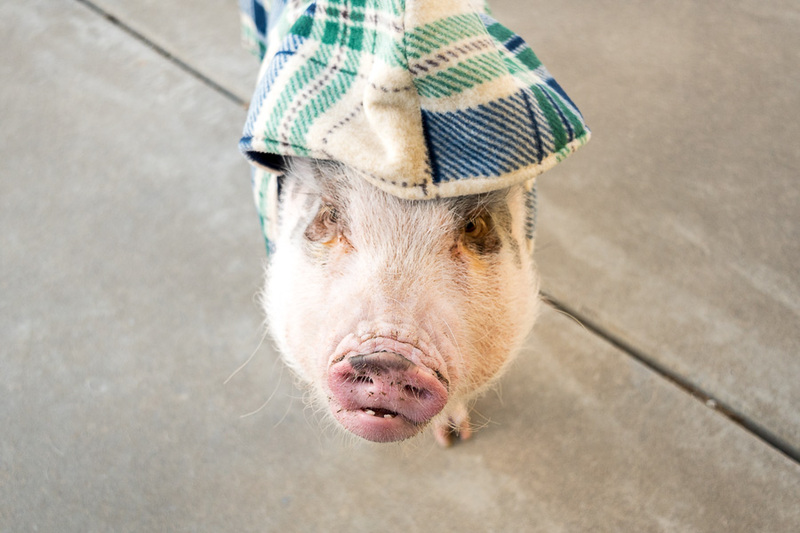 In general, the coat is quick and easy to put on mini pigs, so this is an issue specific to Oscar and isn’t reflective of the coat. Fortunately, treats help make the process faster and more pleasant for Oscar and for us. 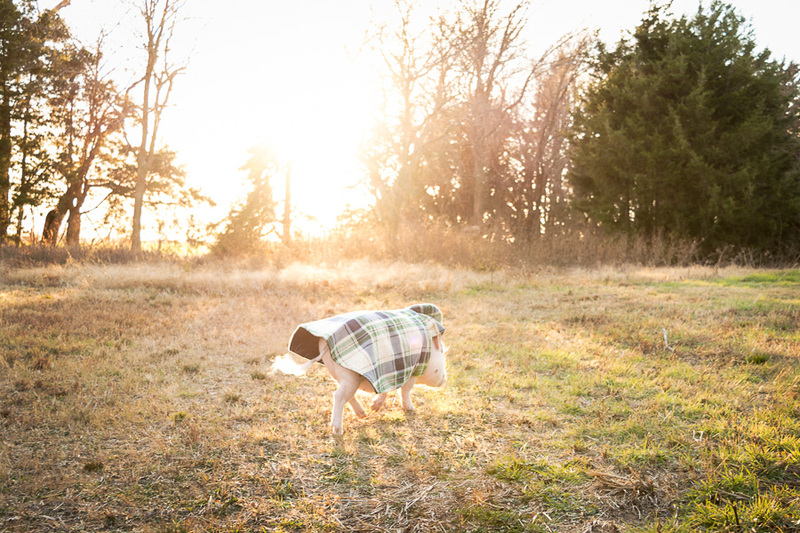 If you’re looking for a winter coat or any outfit for your mini pig, I definitely recommend checking out Snort Life. We have been super happy with the quality and fit on everything we’ve received from Doreen. Oscar’s coat is the His & Hers Hooded Fleece Jacket, but there’s also a collared version without the hood and a new His & Hers Hooded Puffy Jacket that is super cute. Note: I purchased Oscar’s coat from Snort Life on my own and was not asked to do a review. All opinions are my own. Oscar is definitely going to grow some more. He won’t be at full stature until about age 4 so if the coat Doreen made for you is not expandable you may need to get another once he’s reached his mature size. Thanks for the tip, I am going to look at her site and see if I can find something that works for Lewis. I bet Lewis would love a coat! 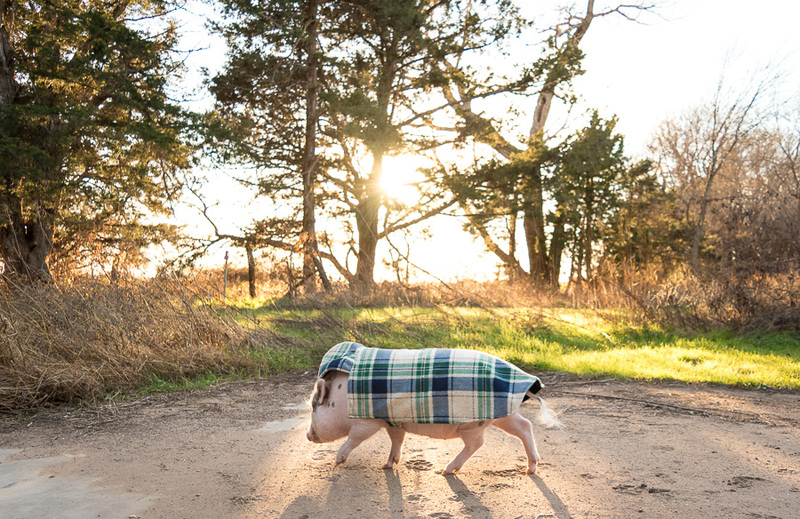 🙂 I’m glad you mentioned Oscar growing because one of the great things about the coat from Snort Life is that it is expandable. Doreen does a great job of making her items with growth in mind, and that makes it easier to buy from there knowing Oscar can fit in it even as he’s growing. If he does grow out of it though, I don’t mind getting him the next size (or two) up. 🙂 Doreen has a pig named Rosie who is about 120 pounds if I remember correctly, so I love knowing Doreen has been through all of these growing stages with Rosie and understands trying to fit a growing pig. Is there a way to post pics on this blog? I would love to share some of our Lewis. Sorry, we may be among the minority but we don’t do Facebook. Even without the coat, he’s already a warm piggy because since he started jumping onto our bed again, it’s been a nightly ritual as soon as the cold set in. Right after dinner, some voracious water drinking, his last potty of the day and some cool down time, he’ll make his way into our bedroom and hop right up. I fire up the electric blanket and get him all cozy and set up for the night. I try to position him in the center of the bed so he’ll sleep cleanly between us. The last thing you want is a horizontal pig in your bed even if it’s king-sized! Once I get him situated and tucked in, I can leave him there and he’s good until we are ready to retire for the night. He’s a terrific sleeper. He’s dead quiet at night except for a couple of soft “woofs” on occasion when he gets up to readjust his position. He doesn’t even snore. He often rests his head on our pillows and gets in really close with me or my wife. He’s an equal opportunity cuddler! In the morning, he’ll wake up and do his kisses the “ha-ha-has” in either my or my wife’s ear and after a few groggy drops back down to reclining, he’ll get up and stand at the edge of the bed to let me know he’s ready and I get up to lower him gently down to the floor. This happens so early in the morning that right after I feed him and after he does his business in the yard, I let him back into the house and he’ll go back to sleep for a couple of hours (this time in his bed) which allows me to go back to mine. Pig owners need not arise for the day with the roosters if you feed them early enough (before sunrise). If you can’t come up with a way for me to do so, I’d be happy to send you some pictures to post. If you have a way of looking at my registered e-mail address for this site, you can e-mail me directly and I will send them to you, if that is suitable. 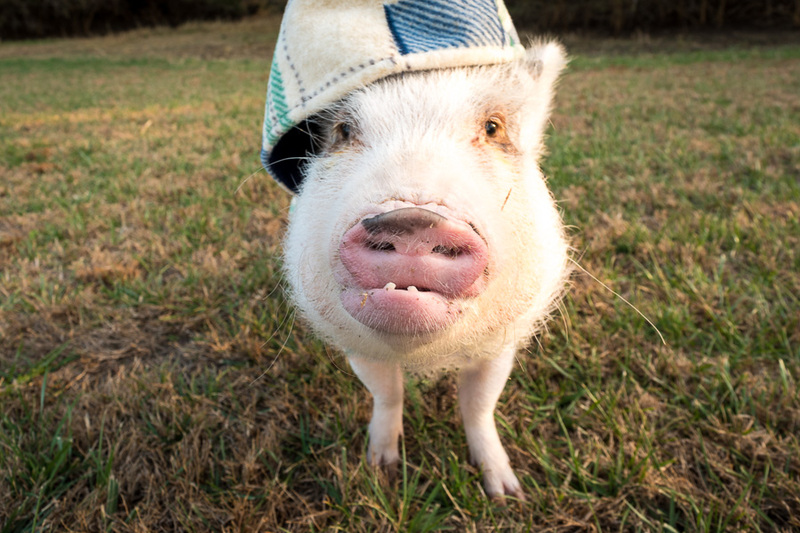 Thanks for hosting this great website for pig lovers! I hope we are a growing population.